What an absolute joke and spineless cop-out that the IOC has made of NOT giving Team Russia a blanket ban for their blatant government sponsored and systematic doping’! I don’t understand why they haven’t used evidence from the McLaren Report to exclude Russia or anyone who has previously been caught cheating or served a ban. As a former Olympic athlete it is soul-destroying to know without doubt that I was competing against athletes who were dirty and to witness this still happening to clean athletes today. As an athlete we know who the cheats are in our sport, but due to heavy repercussions from governing bodies and the likely wrath incurred, most are too frightened to speak out or try and do anything about it. Therefore, as a retired athlete I propose that we show the IOC that they are making a mockery of something we commit our lives to achieving by choosing to #StandDown from the dais to receive medals to say ‘I’m clean and want to compete against clean athletes, but I don’t believe I am’. Yes, there will be collateral damage but something has to be done to say we are not okay with it being swept under the carpet. Athlete’s about to compete in supposedly the world’s greatest competition will be focused on what’s at hand, with blinkers on readying themselves. And while making political statements at an Olympic Games is against Olympic charter and carries heavy penalties I believe if clean athletes, retired athletes and the public band together, we will have strength in numbers! We all believe in what the World Anti-Doping Agency (WADA) is trying to achieve but it is clearly not effective. Testing is not catching the cheats, whistle-blowers and investigations are. Most athletes who use PEDs also usually do it out of competition, as they know they are going to be compulsorily tested at the games, therefore those caught at the games or a competition with legitimate testing are either really dumb or have messed up their doping schedule. I bet if athletes were empowered to set and control the systems there would be a radical change. Life bans, Athlete Biological Passports, a clean level playing field and the restoration of the Olympic Games as the pinnacle of athletic competition. Yes, there will be some athletes who may be clean and others who have likely been forced into doping systems, but this is a stand against the IOC and their pitifully weak decision to not uphold the integrity and core principles of the Olympic Games. Sometimes I wonder if it’s all worthwhile in the face of overwhelming political corruption, and if the Olympics will ever be a clean level playing field restored to the pinnacle of fair athletic competition. But at an individual level, in your own environment, you are the guardian of all that is worthwhile, free and wonderful about sport. Nothing will make them listen more than a significant demand from the athletes and sports fans themselves. Imagine this message; any time a clean athlete received a medal beside a cheat, they choose to #StandDown off the dais to receive their medal. If the clean athletes of the RIO Olympic Games believe as I do that the IOC needs to be made accountable for their actions or lack of them then please make a unified decision to #StandDown for #CleanSport. This is your chance to have your say. I have often heard people say that there shouldn't be politics in sport, and when I (and the NZ swimming community) first started having issues with Swimming New Zealand I too naively thought this. But I came to realize there always will be politics in sport and that I had to accept it, regardless of whether what was happening was good or bad, or right or wrong. Now the governing body of all aquatic sports FINA is showing its true colors, that it cares more about lining it's own pockets than it does about the athletes it is suppose to represent! 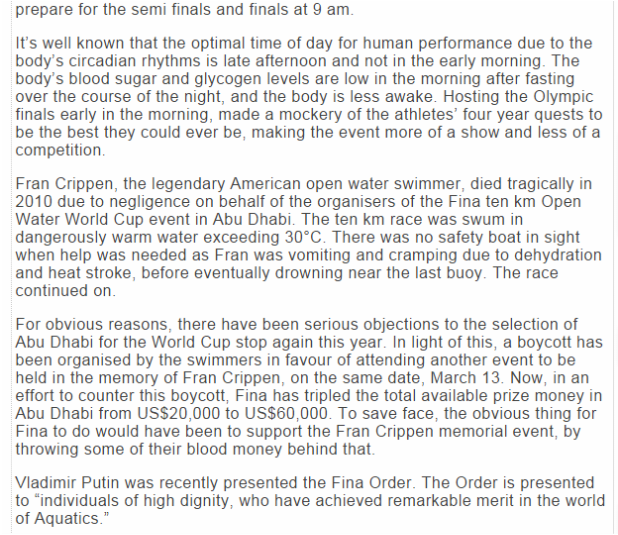 George Bovell, from Trinidad & Tobago, an Olympic bronze medalist and world champion has recently opened the can of worms highlighting FINA's choices that clearly prove it is a complete sell out. Half the reason I retired from swimming was due to the terrible way I was getting treated by Swimming NZ. And now I'm seeing that this is happening at a global level from FINA. When I decided to retired I didn't want any other athletes to have to endure what I went through. I just wanted to swim, doing the sport I loved, but I was constantly running up against barriers and walls created by Swimming NZ. So I decided upon retiring to speak out and went public with how I was really getting treated. I let the public know some of what was really happening and why my last two years of swimming were affected and never as successful as they should have been. This was not easy to do, as Swimming NZ was the hand that feed me and cutting it off was not an easy decision, even though I was retiring. But it was the right decision, and did bring about some change (though extremely slowly and still not satisfactory to this day). 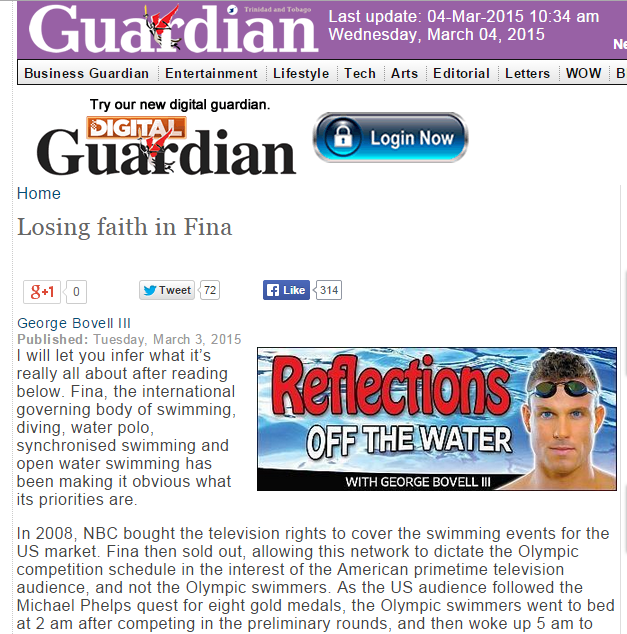 And this is why I take my hat off to George Bovell and fully support him with his great article. 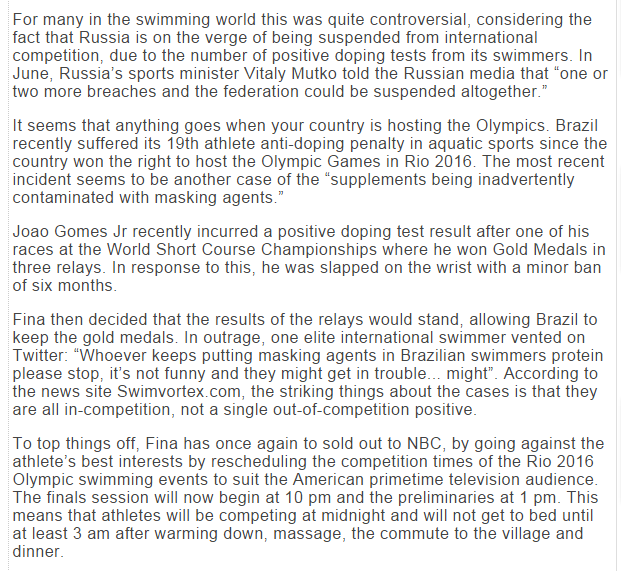 There needs to be change in FINA's, decisions, ruling, policies, etc and this will only come about by the swim community and public knowing what is really happening and then putting pressure on them. Sport is about people first, the athletes and coaches, without them there would be no reason for FINA or other governing bodies to exist. The core question that should always be asked first and foremost is - Will this help the swimmers swim better? If not then why would they go ahead other than to line their own pockets. Firstly what an amazing athlete and person Will Trubridge is, an incredible guy pushing the absolute boundaries of freediving. As a 15x World record holder he is totally dedicated to the sport and this 102m World Record attempt has brought the sport so much attention. Yet he is a super humble guy and I'm honored to have been able to be one of the safety divers for his awesome attempt. As part of the safety team our job is to help assist or rescue an athlete should their dive not go to plan. The key word here is TEAM. I might have a great kick and be quick to the surface but without the other member's vast experience and skills it wouldn't mean much. William wanted an all Kiwi team diving during the attempt and asked Jonathan Sunnex and I to be his deep safety divers. Johnny with his vast experience met William at the 35m mark and I was waiting at 25m, from here we proceeded to shadow him to the surface. 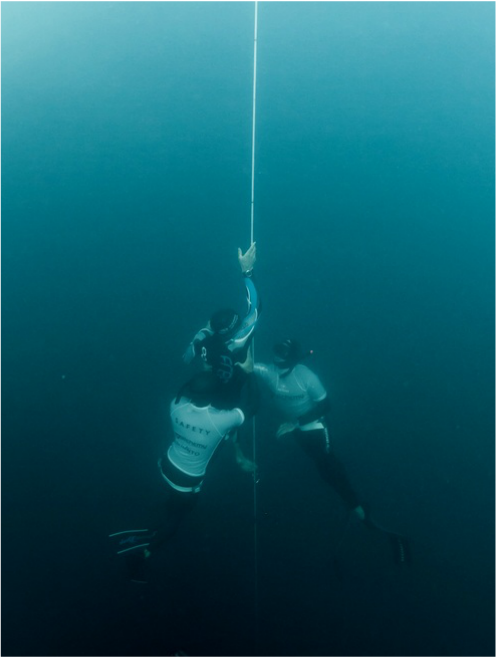 As a safety diver if we touch a diver we automatically DQ them, so on the ascent we try to get close enough to be able to observe the diver, but without touching them until they either DQ themselves or require rescuing. When we follow them up we are mainly focused on their face, looking for signs that they are struggling or about to have a black out from the lack of oxygen. In the case of William's dive today, he acknowledged he wasn't going to quite make it and at approximately 10m from the surface he shook his head to let us know. As I mentioned earlier William is completely dedicated to his freediving and therefore very in touch with his body, including what is happening to it and what is about to happen. After shaking his head he reached forward to pull on the rope and DQ'ed himself. This immediately meant that we could grab William to assist him to the surface as fast as we could. Unfortunately the TV audio was not properly synced with the footage of William's dive so it sounds like we were at 20m when we grabbed him but in fact we were much closer to the surface. It is not easy for an athlete to let go of a goal, and I'm sure it was a difficult decision for William to grab the rope, but in the end it was the smart move. Upon reaching the surface William didn't quite have enough oxygen left and momentarily blacked out. This is when our practice training and safety drills kicked in and you will see that we proceeded to keep his airways above the water, remove is goggles, and preform the "tap, talk, blow" procedure which soon brought William around. Being low on oxygen, very likely narced and having the small black out meant William needed about 20 seconds to get his thinking straight again before we helped him onto the dive platform so that he could recover and be checked by the on-platform doctor. William was so close and as he mentioned in his post dive interview he is not stopping there and will give it another crack in the not so distant future. When you are pushing the limits of what is capable you really do need all the stars to align, and today wasn't ideal by any means. But Will's dive was a very gutsy heroic effort that truly had the support of 1000's of Kiwi's and freedivers around the world. William still has two days ahead of him to compete at Vertical Blue and I'm looking forward to seeing what he can achieve with the weight of the 102m attempt off his shoulders and of course being a safety for him again. I’m new to the sport of freediving and don’t think I really realized what an opportunity it is to be visiting Dean’s Blue Hole and being part of Vertical Blue, that was until I mentioned it on Facebook. I then got plenty of comments from other freedivers saying, “how cool it is that I’m making the pilgrimage to the Mecca of freediving” or how envious they are. With me starting to fully realize what this place and comp means to the world of freediving it was re-enforced while on the first flight to Nassau in the Bahamas. The in-flight magazine contained an article by Brittany Trubridge, William Trubridge's wife. 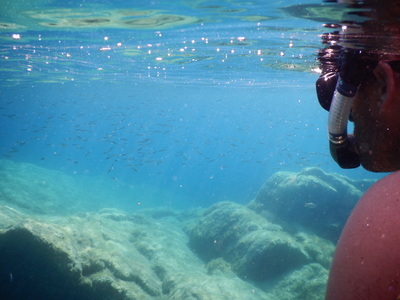 She wrote of her love for the island, growing up here, meeting Will and freediving. But as a kid she was scared of Dean’s Blue Hole, its darkness and the deep unknown, she avoided swimming in it and basically never across it. This made me start to realize what a special place it must be, Will obviously realized this a long time ago, hence his choice to make the island his home and the Blue Hole his playground. After a 4 hr wait at Nassau airport we arrived in the evening at Long Island, Daan Verhoeven (a well known and very capable diver) was waiting to pick us up at the airport. Dean’s Blue Hole beach clean up had started at 3pm so when we arrived at the accommodation and no one was there we headed for the Blue Hole! The clean-up had just finished so Johnny Sunnex and some of the other safety team and organizers were milling in the carpark. I said my hellos, Will was there but on the phone and even though I had never met him all I wanted to do was see the hole! So I politely excused myself and walked towards the beach. From the carpark the hole is to the left, the weather for the last week has been messy and pushing into the hole, though reasonably sheltered from the ocean directly the water wasn't crystal clear, with plenty of weed and unfortunately rubbish floating in it. Though despite this it was still amazing, the evening sun was setting so the cliffs on the far side were glowing, and the beautiful white sand led the eye to the water’s edge. I immediately was drawn towards the hole, half way across the beach I realized I still had my shoes and socks on, I bent down removing them quickly without even undoing the laces. I walked straight to the water’s edge, peered down then stepped forward into the water. Though not the most spiritual type I had an immediate argue that I wanted to connect to the place and the only way to do it properly was the feeling that I needed to be in the water. On the edge the shallow water over the fine white sand is an amazing turquoise blue, but it quickly drops away and only 5m out the lurking darkness of the hole begins. I just stood and stared for a while, taking it all in. People were done for the day (or so I thought, read part 2...coming), so it was empty, quiet, peaceful, and had a real energy about it. Standing there calf deep in the water and feet buried in the sand I could now really appreciate and understand why people said Dean’s Blue Hole was such a special place. Well I am now currently travelling the world and blogging about it via a couples adventure travel blog called - Four Jandals. 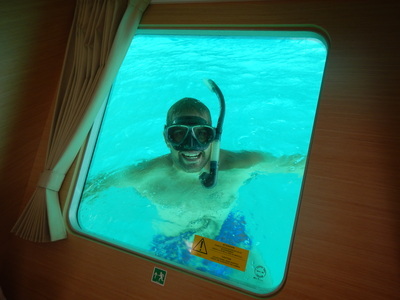 My first blog on it is about a free diving video I made while I have been aboard a sailing boat. I also felt it was appropriate to share here, enjoy. Many people travel the world and see its amazing sights, but most have no idea of the incredible sights that it holds under the surface. Those that have never properly put their face under the surface with a clear underwater view are truly missing out! Did you know that 71 percent of the earth is covered by water and 95 percent of the underwater world remains unexplored according to NOAA. So can even the most seasoned travellers say that they have really travelled and explored the world thoroughly? I love the water and all the activities that it allows me to do, from my past as an Olympic swimmer to more recently getting serious about my spearfishing and freediving. 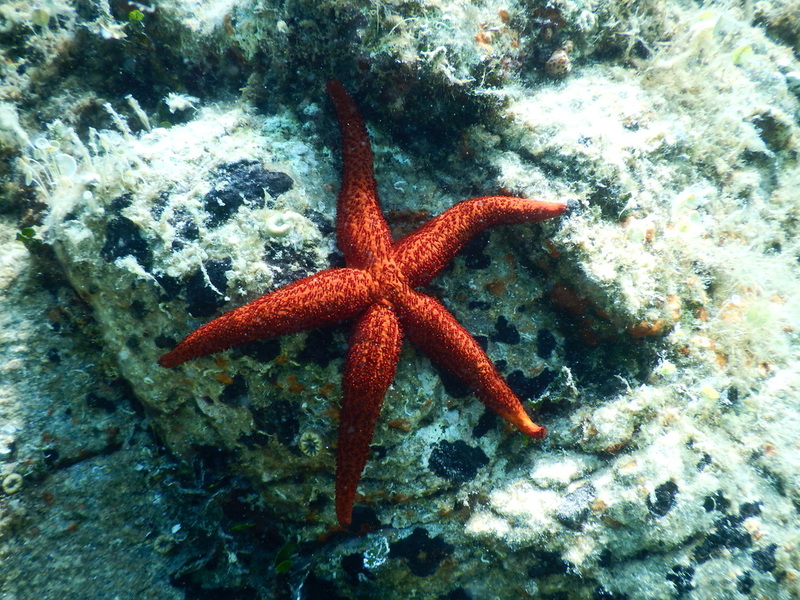 The water is essential to all life and is what makes planet earth unique, it should be respected but not feared, and is a wonderful place that should be seen and experienced by all. The ocean and its underwater life are phenomenal and should be at the top of everyone’s must see and do’s. Recently while sailing from Greece to Sardinia I jumped in the water at an Island called Favignana, on the Western end of Sicily, Italy, and captured some of fish life and scenery (including a shipwreck) while freediving. As you can tell I’m passionate about the ocean and its sea life, so rather than try and describe it I made a short video. 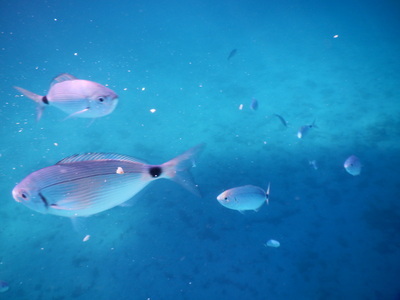 Although not the most amazing aquatic sea life I have seen, it gives you a glimpse into the amazing underwater world that awaits those that truly choose to travel and explore this wonderful unique world and all its holds. Sharing what I have been up to since retiring from professional swimming. Not necessarily directly swimming related posts but still to do with the water.